Samsung Electronics’ woes mounted Friday with the U.S. Consumer Product Safety Commission urging consumers to power down and stop charging or using their Galaxy Note 7 smartphones, after reports of the overheating and bursting of the lithium-ion battery in the device in some cases. The statement by the CPSC comes a day after the Federal Aviation Administration advised passengers not to turn on, charge or stow away their devices in checked baggage when on board aircraft. Three airlines in Australia, including Qantas, its unit Jetstar and Virgin Australia, have also prohibited their passengers from using or charging the Galaxy Note 7 during flight. 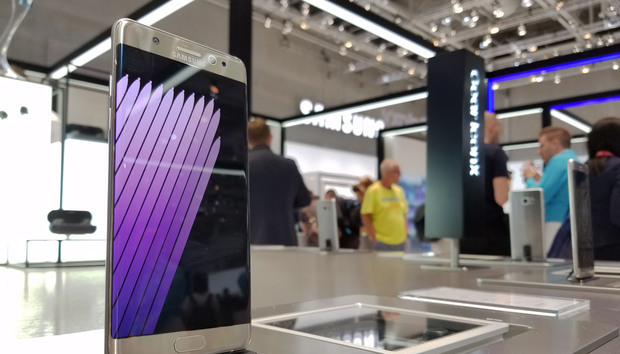 The incidents relating to the Note 7 smartphones have occurred both while charging and during normal use, CPSC said. The agency, which is charged with protecting the public from risk of injury or death linked with consumer products under its jurisdiction, is working with Samsung to formally announce an official recall of the device. Samsung last week stopped sales of the Galaxy Note 7 and volunteered to replace the device for its customers following 35 cases reported worldwide as of Sept. 1 that suggested a battery cell issue in some of the devices. On Friday, Samsung confirmed it was working with the CPSC on the battery cell issues of the Note 7. "We are asking users to power down their Galaxy Note7s and exchange them now.” said Tim Baxter, president of Samsung Electronics America, in a statement. The company could delay replacement of the Note 7 phones with new ones, as it said that the replacement Note 7 phones will be issued to exchange program participants upon completion of the CPSC process. For such users, Samsung is offering through select carrier and retail outlets a loaner phone to use until new Note 7 devices are available. “In the interim, consumers can return their Note7 for another device,” Samsung said. The South Korean company offered last Friday to swap existing Note 7 phones for new phones to be available in the next week. But the CPSC said it would be looking into whether a replacement Note 7 is an acceptable remedy for Samsung or phone carriers to provide to consumers. A U.S. Product Exchange Program from Samsung also offered to exchange current Galaxy Note 7 devices for a Galaxy S7 or Galaxy S7 edge and replacement of any Note 7 specific accessories, with a refund of the price difference between devices. To placate users, Samsung further offered consumers a US$25 gift card or bill credit from select carrier retail outlets. Consumer Reports, a consumer advocacy group, had earlier recommended that CPSC be involved in an official recall program. Multiple retailers in the U.S. were still selling the phones last Friday after Samsung’s announcement that it had stopped selling the phones, which would have been illegal under an official recall from the CPSC, it said. On Friday, Consumer Reports welcomed the progress on an official recall, saying that besides making it illegal to sell the phone, it would lead to government oversight of the replacement program and provide clear guidance to consumers.